I've had my nails done with gel polish twice now - once with Jessica Geleration and once with Shellac and I am completely sold! This has made me really interested in buying some gel manicure items for home so I can at least remove my own, and at best do a really great gel nail manicure on myself and my Mum. However, it turns out the whole thing isn't easy (who'd have guessed people have to do qualifications in this!) and I have ended up putting a frightening amount of research into the whole thing (hopefully not at the expense of my PhD!) It seems you have to be really aware of what you are buying to ensure great results. I thought at the time it would have been so helpful if someone had written an easy guide on everything, then I thought I could share my research so far with all of you. I will try and reference my sources like a good researcher as and when I can, but some of it I have just picked up and can't remember where from. 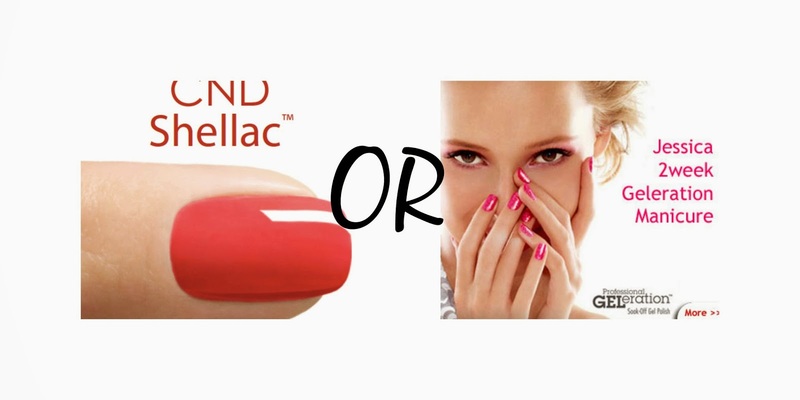 It seems there is a big difference between shellac and gel systems such as Geleration and Gelish chemically meaning you'll have to make a decision at this point which you go for. Personally, I'm going for gel nails for the simple reason that there are more colours in the range and there are several brands making gel nail polishes where as Shellac appears to be the only company doing their style of polish (and knock-off brand BlueSky). It is important to make a decision at this point as this changes what type of curing lamp and what equipment you will need. This part seems the most challenging to me! There are two types of lamp, UV and UV LED. The difference being that UV cures nails using Ultra Violet light which takes about 2 minutes per layer where as the UV LED lamp uses a different wavelength of light which takes 10-30 seconds to cure. There is a fear with long-term treatments that the UV lamps can cause skin cancer too which can swing the decision for you. There are also different strengths of lamp which you can understand by finding out what wattage the lamp is. The decision as to what lamp you will buy depends on what system you have chosen. For Shellac, it is important you buy only a UV lamp with a minimum of 36W (reference) as LED light will not cure Shellac (yet). Professional gel systems such as Geleration, Gelish and Gelux will require a minimum 30W UV LED lamp, or 36W UV lamp (reference) with the huge difference being drying times (and cancer risk). It is best to choose a lamp which has automatic timing buttons on and good bulb positioning around the lamp. Here there is a difference between gels and shellac again. With gel systems, you have to use a fine buffer to take the shine off the top of the nail before application, where as with Shellac you don't. With gel systems, you have to apply a bonding coat before the base coat to increase adhesion to the nail, where as with Shellac you don't. (you don't have to apply it before gel base coat if you have issues with removal on your nails either apparently). Shellac takes longer to dry than the gel systems because you are not using a UV LED lamp. Again there is a slight difference between brands, but on the whole removal is very similar. The guides referenced above tell us how to do it in detail but basically you just soak off the old colour and it shouldn't damage nails. In gel systems you have to buff the surface of the old manicure to break the seal, but in Shellac you don't.